Here at Liang & Quinley Wealth Management, we find great value in education. We believe it is important for our minds to continually grow and be challenged. Below are the current designations held at our company. Michael Liang and Christopher Quinley both hold the Certified Financial Planner™(CFP®) designation. This is a professional certification mark for financial planners conferred by the CFP Board in the United States, and by 25 other organizations affiliated with Financial Planning Standards Board (FPSB), the international owner of the CFP® mark outside of the United States. 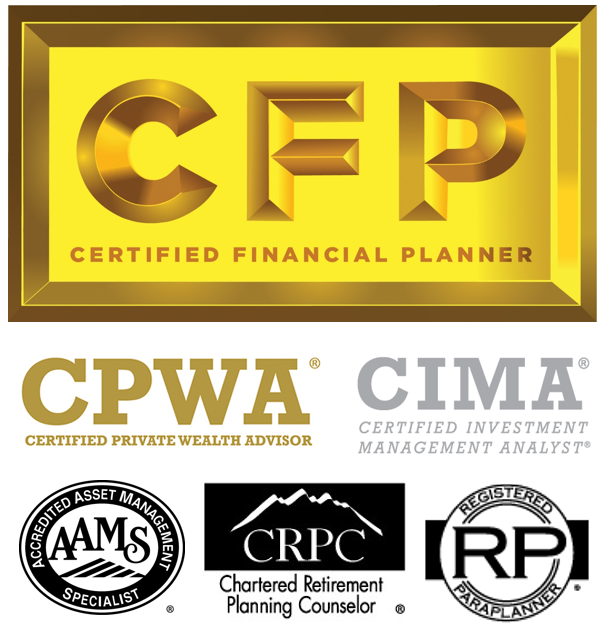 To learn more about the CFP® designation, visit www.cfp.net. Christopher Quinley obtained the Certified Investment Management Analyst™ certification in December of 2015. Only 2 percent of financial services professionals hold CIMA certification, which is delivered by Investment Management Consultants Association® (IMCA®) and is the only credential designed specifically for investment advisors and consultants. To learn more about the CIMA® designation, visit www.IMCA.org. Michael Liang passed the Certified Private Wealth Advisor™ Certification Program in October of 2013, delivered by Investment Management Consultants Association (IMCA) and The University of Chicago Booth School of Business. For more information about IMCA or the CPWA® designation, visit www.IMCA.org. Christopher Quinley holds the AAMS® designation. To learn more about the AAMS® designation, visit www.cffpdesignations.com/Designation/AAMS. Michael Liang holds the CRPC® designation. To learn more about the CRPC® designation, visit www.cffpdesignations.com/Designation/CRPC. Tammy Monsanto received the Registered ParaplannerSM (RP®) designation in November 2013. To learn more about the RP® designation, visit www.cffpdesignations.com/Designation/RP. Accredited Asset Manager Specialist® and AAMS® are trade marks or registered service marks of the College for Financial Planning in the United States and/or other countries. Chartered Retirement Planning Counselor® and CRPC® are trade marks or registered service marks of the College for Financial Planning in the United States and/or other countries. Registered Paraplanner® and RP® are trade marks or registered service marks of the College for Financial Planning in the United States and/or other countries.